Bronchial artery (BA) embolization (BAE) is a very effective procedure in massive hemoptysis with prompt cessation of bleeding in nearly 77% of the patients. Nevertheless, there are significant procedural complications including technical failure with continued hemoptysis, aortic dissection, mediastinal hematoma, esophageal necrosis, bronchial ischemia, systemic infarcts, and cerebral and spinal cord infarctions (SCIs). ,, Even with careful angiography an SCI can complicate 1-6% of BAE procedures. We present a rare case of thoracic cord infarction with Brown-Séquard syndrome after BAE. 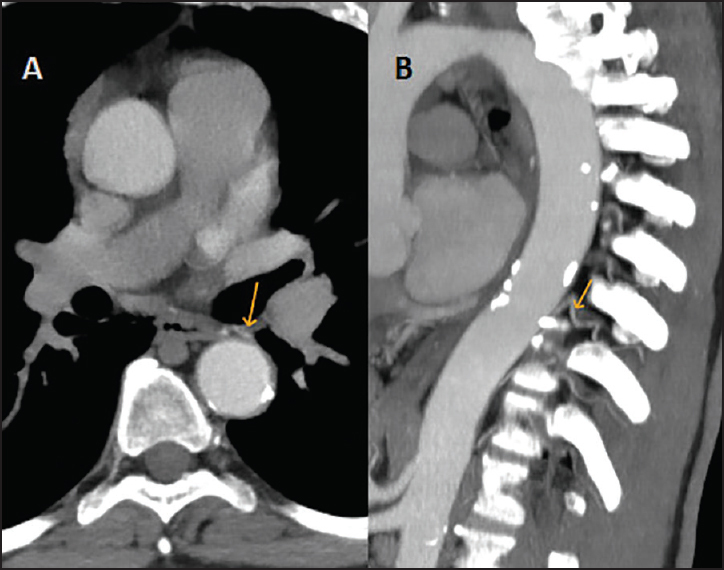 A 65-year-old male smoker presented with massive hemoptysis of 30-min duration. 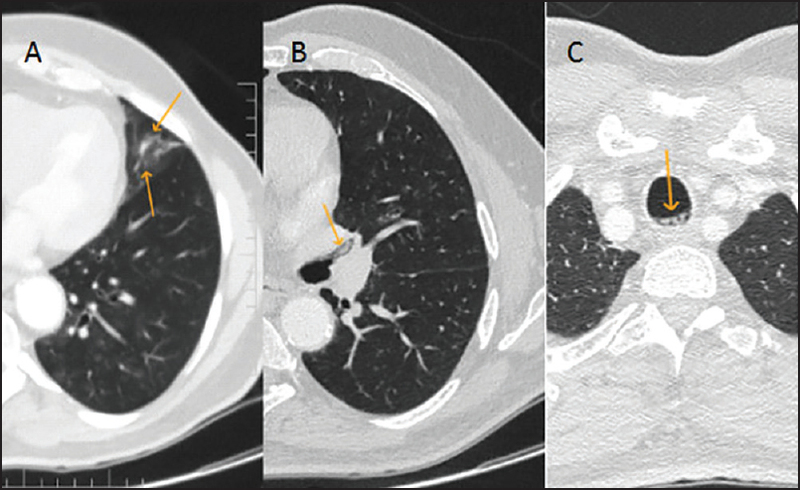 Thoracic computed tomography (CT) with angiography showed ground glass opacities in the lingular segment with clots in the lingula, bronchus, and trachea with a tortuous BA and a prominent left D10 intercostal vessel [Figure 1] and [Figure 2]. He underwent BAE. Via a right femoral access, the bronchial and intercostal vessels were cannulated with a reverse curved catheter. A tortuous left BA arising from a common bronchial arterial trunk and a prominent tortuous left D10 intercostal artery were noted [Figure 3]. No spinal arterial supply, bronchopulmonary fistulous communications, or pseudoaneurysms were imaged. The bronchial arterial bed was embolized with fine gelfoam slurry, and the D10 intercostal vessel was partially embolized with coarser particles. The patient was partially embolised during the procedure. The left internal thoracic artery angiography was normal. Immediate postprocedure neurological examination was normal. The next morning, he complained of weakness of the left leg and paresthesia in the left leg along with urinary retention. On examination, his left leg was flaccid with grade 0/5 power in the left leg. Vibration sense was absent in the left leg till ~D10 level and pain and temperature sensations were absent in the right leg till the right hip. Both plantar reflexes were extensor. An urgent magnetic resonance imaging (MRI) of the brain and spine was normal. He was started on intravenous (IV) methylprednisolone (1 gm/day × 5 days). A repeat MRI spine after 36 h showed a hyperintensity in the sagittal T2 image at D5-D6 levels. T2 axial images at D5-D6 levels showed a centrospinal hyperintensity consistent with SCI [Figure 4]. Over the next week, he developed grade 3/5 power in the left knee extensors with grade 0/5 power in the knee flexors and hip extensors. There was only a mild recurrence of hemoptysis. CT chest revealed bronchiectasis in the left lower lobe, lingular lobe, and right lower lobe. Positron emission tomography (PET)-CT of the chest was negative for a malignancy. At the follow-up after 3 weeks, he was ambulant with a walker and his power had improved to grade 4/5. The anterior spinal artery (ASA) supplies the ventral spinal cord and is augmented at various levels by four to eight anterior radiculomedullary arteries (RMA) originating from the vertebral artery, cervical arteries, and thoracic (intercostal) and lumbar (segmental) arteries. At the level of the BA, the RMA can directly arise from the BA itself (5%), from a D4-D5 intercostal artery (15%), or a common ICBT. The largest RMA - the artery of Adamkiewicz (AA) - supplies the lower two thirds of the spinal cord. It is usually left sided and located at either D9-D12 levels [74%] or D5-D8 levels [15%]. In contrast, the smaller paired posterior spinal arteries are fed by 10 to 20 radiculopial arteries (RPA) arising from the segmental spinal arteries. SCI is more likely in the RMA territory as the anterior supply is relatively impoverished compared to the posterior supply. It is noteworthy that even meticulous spinal angiography does not preclude SCI during BAE. 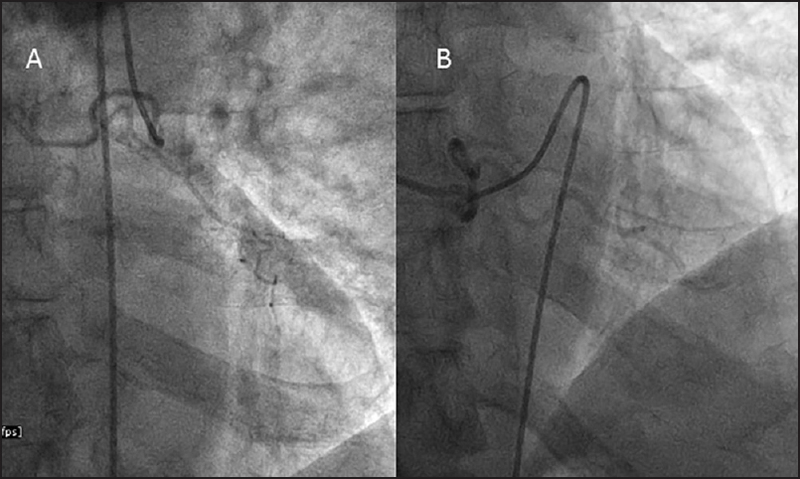 Infarction may occur due to technical factors, inadvertent embolization of material into spinal arteries, or indistinct anastomotic connections between the bronchial circulation and the spinal arteries. These anastomoses may manifest only after embolization of the nearby hypertrophied branches that results in compensatory redirection of blood flow and opening up of hitherto indistinct connections. Super-selective angiography using coaxial microcatheter systems can reduce the risk of SCI; however, it cannot be excluded completely. Nevertheless, long-term follow-up of patients with SCI due to diverse conditions provide meaningful recovery in the substantial majority of patients. In conclusion, we report a rare case of SCI after BAE and reiterate the importance of informing the patients about the potential complications prior to performing BAE. Mal H, Rullon I, Mellot F, Brugière O, Sleiman C, Menu Y, et al. Immediate and long-term results of bronchial artery embolization for life-threatening hemoptysis. Chest 1999;115:996-1001. Mesurolle B, Lacombe P, Barre O, Qanadli S, Mulot RO, Chagnon S. Failures and complications of bronchial artery embolization. Rev Mal Respir 1996;13:217-25. Ma KF, Wong WH, Lui CY, Cheng LF. Renal and splenic micro-infarctions following bronchial artery embolization with tris-acryl microspheres. Korean J Radiol 2009;10:97-9. Peng G, Liang H, Ruan L, Luo B. Cortical blindness and ataxia complicating bronchial artery embolization for severe hemoptysis. Intern Med 2010;49:1445-7. Yoon W, Kim JK, Kim YH, Chung TW, Kang HK. Bronchial and nonbronchial systemic artery embolization for life-threatening hemoptysis: A comprehensive review. Radiographics 2002;22:1395-409. Sidhu M, Wieseler K, Burdick TR, Shaw DW. Bronchial artery embolization for hemoptysis. Semin Intervent Radiol 2008;25:310-8. Gillilan LA. The arterial supply of the human spinal cord. J Comp Neurol 1958;110:75-103. Brown AC, Ray CE. Anterior spinal cord infarction following bronchial artery embolization. Semin Intervent Radiol 2012;29:241-4. Robertson CE, Brown RD Jr, Wijdicks EF, Rabinstein AA. 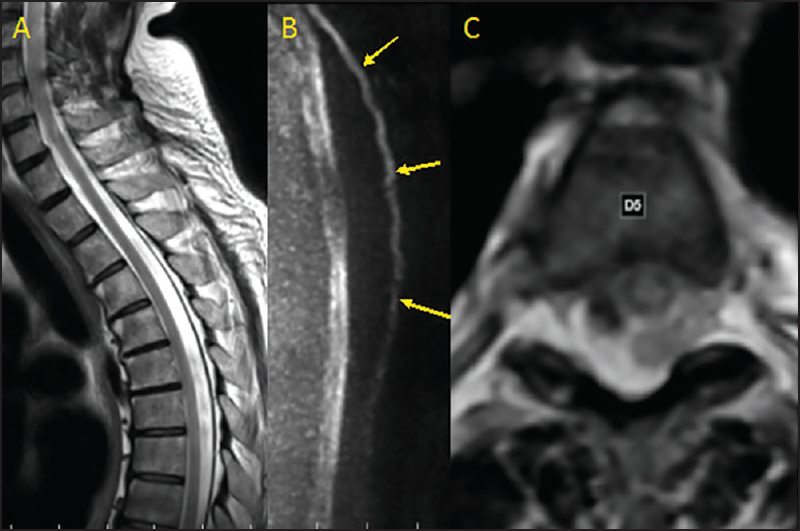 Recovery after spinal cord infarcts: Long-term outcome in 115 patients. Neurology 2012;78:114-21.